Hidden away in a mini mall off Charleston, at 1029 S. Rainbow in Las Vegas, Nevada is a friendly, wonderful, family-owned restaurant called Jamm’s. I discovered it a year ago when I was at the Albertson’s in the same mall shopping for my Christmas baking. Jamm’s is the kind of place I pray to find: family owned with tons of regulars that the Klein family treats just like family. 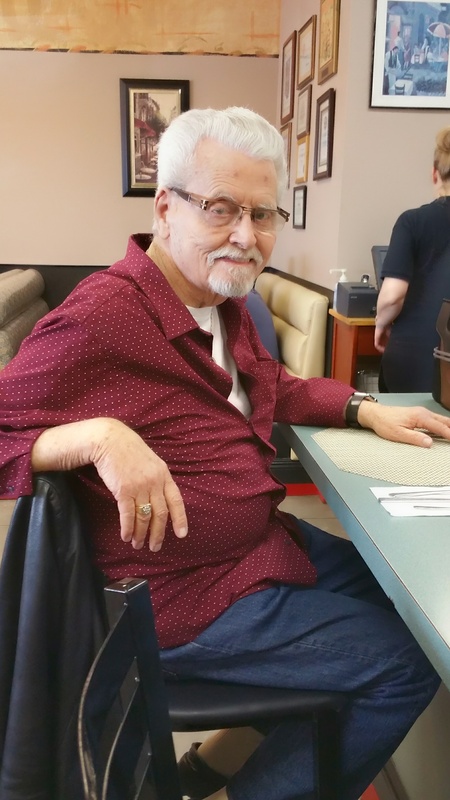 You can see the look on every diner’s face as their food comes and the happy, like the content expressions Jack has who has been a happy customer since Jamm’s opened. Jamm’s has a history of 20 years and a legacy of memories that paint the walls like a patchwork quilt with happy customers. Not only can you get fabulous omelets, with signature, unique ingredients like the Mediterranean Omelet, buy you can get a wide array of American Regional favorites too. The eggs were cooked to perfection and the combination of flavors reminded me of Spanikopeta from Greece-with spinach, feta cheese, black olives and hollandaise sauce. All in all they have nineteen different omelets, including owner’s Ronni Klein’s recommendation of the Reuben Omelet. Can you believe Jamm’s cooks found a way to merge a waffle and pizza? They did! They have what’s called the Waffle Pizza with a freshly made waffle for the crust, smothered in marinara sauce, topped with mozzarella cheese. Jamm’s Restaurant made the TV Headlines with their Jamminator. It was made famous by Adam Richman on Man Finds Food on the Travel Channel. It consists of a Reuben Omelet on a deep fried battered pretzel bun. 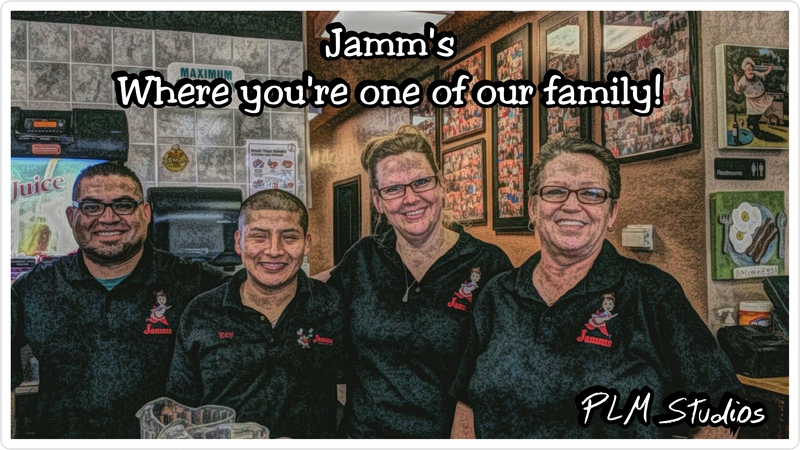 So, in other words, you’ll find a little bit of everything at Jamm’s: comfort foods, unique and innovative flavor combinations and owners who care about every person who walks through their doors. It is evident in all they do. They could be famous for their baked breads alone in my opinion. 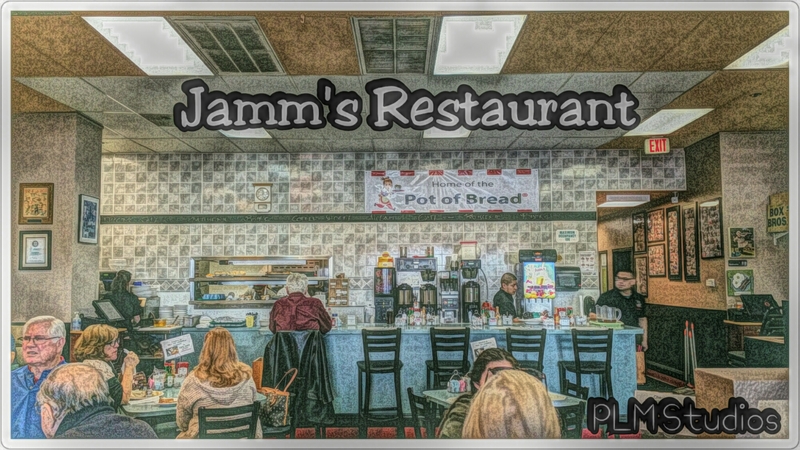 There are so many choices at Jamm’s. I only wish they were open later in the day, but that is what makes this place so special. They are not open all day long. They are famous for many things, but with me the bakers should get an award for baking up their tender, fragrant Pot of Bread! I got the Cinnamon Raisin today with my omelet. They also have a plain Pot of Bread and a specialty flavor that is made weekly. You just need to ask your server what the bakers are baking up that week! You can also take home a 4 pack for a mere $6.95! 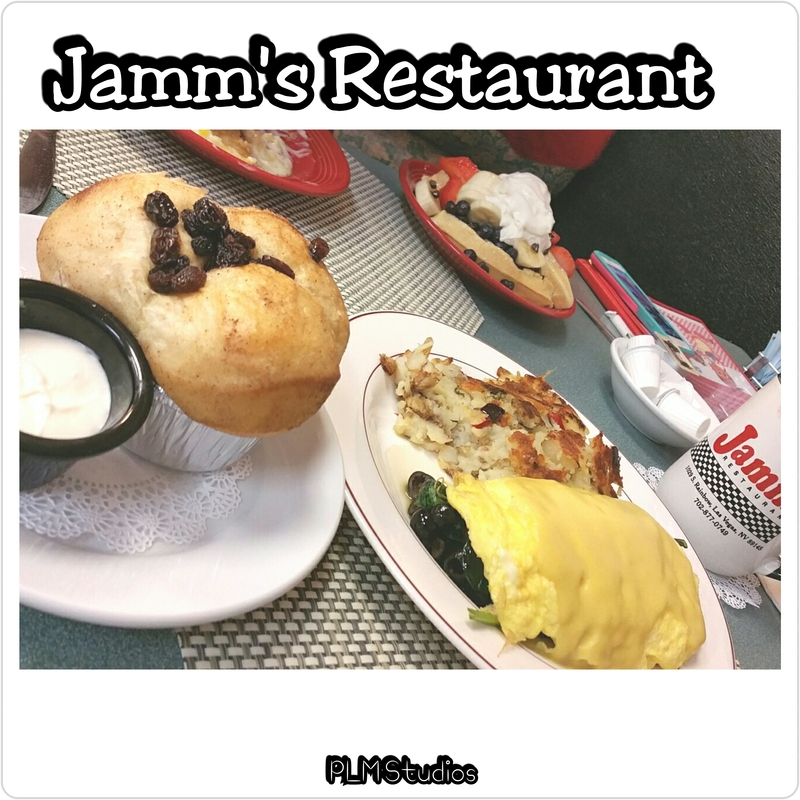 If you like pancakes and waffles, or Chicken and Waffles; Jamm’s features seven specialty pancakes, and even an unusual savory waffle called a Chicken BLT Green Waffle which is a deep fried battered waffle with green onions, crispy chicken, cheddar, bacon, lettuce and tomatoes, served with French fries. Their French Toast Fries can be eaten on the run when you don’t have much time or don’t want a huge breakfast. Jamm’s has inventive sandwiches, wraps and paninis that will knock your socks off, or at least make your mouth water looking at them! Their Blast Sandwich is a twist on a BLT with added Swiss cheese. I want to try the Chicken and Peppers sandwich with grilled chicken and roasted peppers, pepper jack cheese on pretzel bread. How about this for unique-Turkey, Swiss and Pear Wrap? Jamm’S combines turkey, Swiss cheese, fresh spinach and a thinly sliced pear in a tortilla with a warm honey mustard dressing. I lived in southern CA over 40 years, so their California Club is one of my favorites-which is a club sandwich with avocado. Their Cuban Panini is another one of their specialty sandwiches with ham, pulled pork, pickle, provolone cheese, mayo and mustard. That would make any Cuban’s mouth water if you ask me! They have six fresh salads to choose from. Among my favorites are the Chinese Chicken Salad, Epinard Salad with spinach, grilled chicken, bleu cheese, apples, nuts and bacon and a sesame dressing. You’ll find a wide selection of homemade soups and which are one of my weaknesses. You will surely feel like your grandmother is cooking for you when you check what’s cooking in their soup bowls. Flavors like-French Onion, Tuscan Bean, Cabbage, Tortilla Soup and New England Clam Chowder will delight your tastebuds. 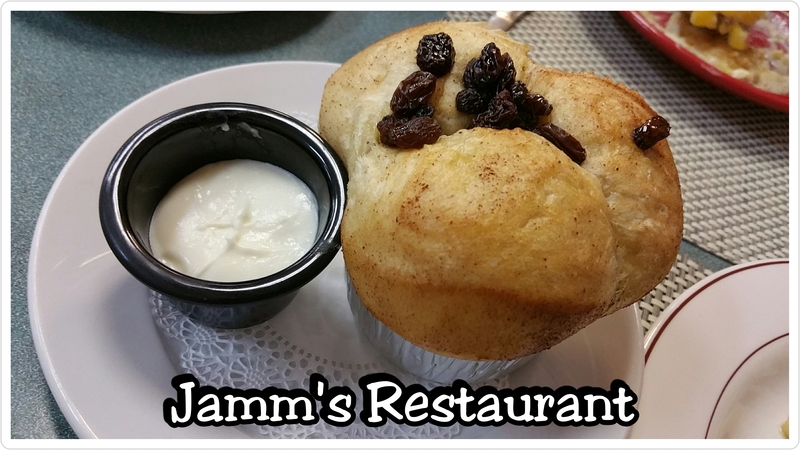 Kids and seniors who are kids at heart will love it at Jamm’s with the very friendly, down to earth, family atmosphere. Everybody will feel at home here. There are menu selections to please everyone. 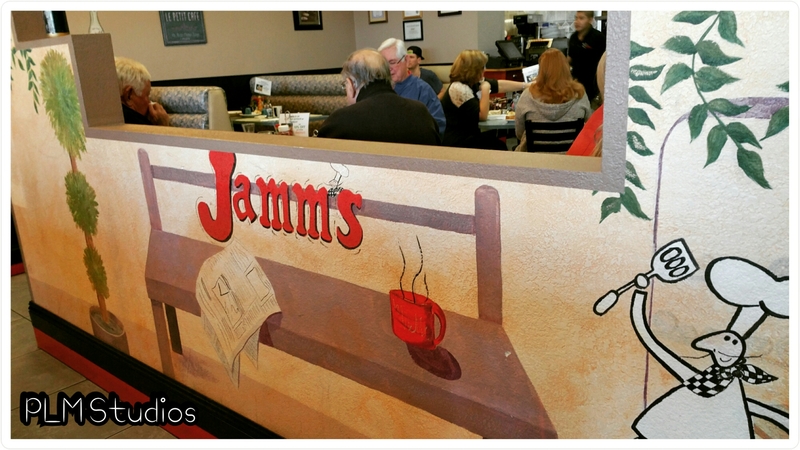 Drop into Jamm’s today and tell The Klein Family Polly Motzko sent you there from SuperRestaurantShowCase.com! They are located the Albertsons shopping center on the corner of Charleston and Rainbow in Las Vegas, Nevada.